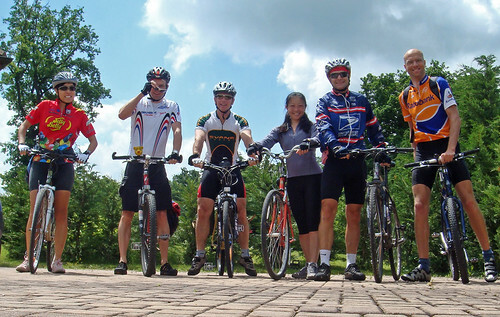 It’s 2009 and time for my 5th annual cycling challenge! 2008 was the biggest cycling year of my life. I don’t think I’ll even attempt to top it. But as always I will be searching for new climbing adventures, good photos, and some fun. Along with the usual big climbs near me, I hope to spend a little more time exploring the many great climbs in central Switzerland, as well as a visit to the Dolomites in Italy. In November, Martin and I had our names drawn to compete in the Maratona dles Dolomites in Italy, July 2009. I’ll write a review of the course soon. Lose 7 – 10 pounds by April 30th and keep it off until year end. In 2008, I had a weight challenge to lose 13 pounds and keep it off. Well, I lost the 13 pounds by June 30th, but have since regained 6 pounds. Failure. Still, the good news is I am 7 pounds lighter than this time last year. I will pay a lot more attention to my weight than I did in 2008 and will post my weight loss status on the sidebar on the right. 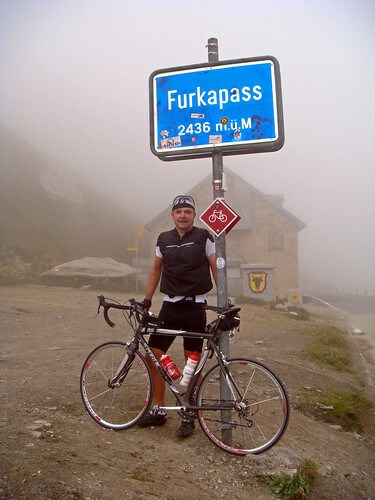 In 2008, I had a great time entering 7 cyclosportives. I had done a couple the year before, but all these events was a new experience and a lot of fun. I plan to enter several in 2009. I’ll post some possibilities soon, but Martin is eager to do l’Etape du Tour up Ventoux – which seems like a great idea to me. Why no altitude challenge this year? Achieving my ascent targets meant I needed to be constantly riding up hills! I am hoping this year’s challenge will allow me to cycle a little less in 2009. I just wanted to say a big “Thanks” to Doreen and everyone else that has tolerated my “Challenges” and given me so much encouragement. I am much fitter, active and happier than a few years back. I look forward to more great days in 2009. I will launch my 2009 Map of climbs after the first ascent. Next Article My New Favourite Winter Sport? Good one! You can count on me to join you on many of your rides … for the Cyclosportives you’ll have to count on Martin as your domestique though 🙂 … you know I don’t pay to suffer. I don’t agree on the weight loss failure though. The kilos you regained are cycling muscles. You are fitter than ever. I’m sure that Doreen will confirm that. Your 2008 Challenge update is stuck on Nov 15th? Any update? What a great plan for 2009. I wish you all the best with achieving your goals but from what I read on your blog the past few months I feel fairly confident that you won’t have any problems achieving them. Happy New Year! Yay, I get to go to Italy for vacation!! Great targets – all the best. A really interesting website, and pretty inspiring. Happy New Year. Best of luck with your goals this year – though based on track record I am sure you will achieve them. I look forward to following your progress in 2009. Looking forward to 2009 and perhaps you can make a special guest appearance on the ‘Tour de Haute Coffee et Donuts du Europe’ Charity Ride? mais tu n’a pas 100 ans ! tout d’abord, bravo pour cette année 2008 et cette constance dans l’effort qui reste un exemple pour nous tous. pour 2009, tous mes encouragements, je trouve bien d’avoir visé “mieux” plutôt que “plus” de vélo. j’espère que ces 100 cols t’entraineront plus à l’ouest vers nos contrées moins hautes mais tout aussi belles! I love how your goals are so SMART…and the S in SMART is ‘Specific’. Good luck for another year in cycling adventures! My 2009 challenge will be to get to Geneva in better weather! Congratulations on hitting your 2008 goal, which was an amazing feat. To me, your 2009 goal sounds just as daunting. You know, many bicyclists don’t even ride two days a week, much less average two cols per week for an entire year. I wish you good luck, although I already know you’ll achieve it! I’m stunned by some of the photographs and more determined than ever to make our planned crossing of the Alps next year a reality. My son has just issued me my challenge for 2010 all three sides of Mont Ventoux in one day, it is he says to celebrate my 70th year, I suspect other motives. I’ve done it once in 2000 with my wife on a tandem, it’s hard. Wow, Ventoux all three sides is a fun (VERY difficult) challenge. I wish you all the best. You might be interested in the link below. 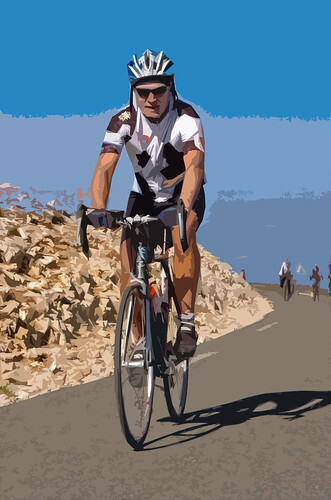 Inspired by the challenge to do all three sides of Ventoux in one day a local cycling coach helped invent another challenge to do 4 sides of an incredibly steep mountain near me. Wow Will! I’m impressed with these challenges of yours. I set some cycling goals this year and made them all and had my best year on the bike and it’s about half of what you did. (5000km and 80km vertical) Very impressive. Great stuff! 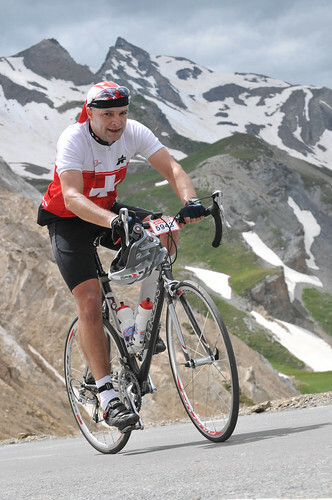 I hope that the 100 col challenge is to ensure you’re membership of the Club des Cent Cols http://www.centcols.org/ , if not, nice to get your name on their honour board! Congratulations on your efforts again this year – and perhaps (just perhaps) its time to lose the “more enthusiastic than talented” tag – it takes some considerable talent (as well as grit, guts and determination) to achieve what you do! Nice site, inspiring to many, good to have goals, and climbing is a good one. I’ve done: 1,000,000 meters and 75,000 km. Well, the inspiration worked! We cycled from Paris to Venice in 14 days in September 2010, covering 900 miles, climbing over 15000 metres (around 50,000 ft) with full camping kit. We (well, I) were slower up the cols than I imagine most people are, with all that weight (me and bike, minus water, weight 110kg before we set off). It was a great adventure, with few problems apart from fading daylight once or twice, a couple of Campag component breakages (not mine) and two punctures (again, not mine). I wore out two sets of brake blocks on my old mountain bike, camped in a £25 tent on an £18 sleeping mat (both from Amazon) and with an old Millets sleeping bag. Panneirs cost me £18, including postage, from Ebay. The bike was my wife’s, so cost me nothing. 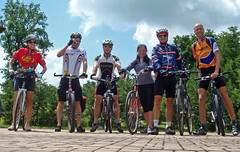 See more about the trip at http://lexpress-charitycycleride.blogspot.com, including a fantastic gallery.